As Governor Cuomo is nearing a decision on whether to open New York to fracking, the momentum is building for him to issue a statewide ban. To keep the pressure building, there’s going to be a huge rally in Albany on Tuesday, featuring actors Mark Ruffalo and Mellisa Leo, with music by Natalie Merchant and many others. 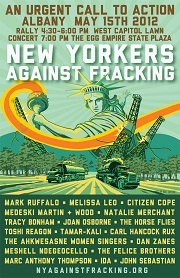 This entry was posted in News, Politics and tagged Albany, Fracking. Bookmark the permalink.